There is a special tasting of Washington and Oregon wines in London today, held at the Institute of Contemporary Arts at 12 Carlton House Terrace. More than 190 wines from 40 Pacific Northwest wineries are being sampled. Marty Clubb of L’Ecole 41 in Walla Walla is leading an educational seminar about the Washington wines and Howard Rossback of Firesteed is doing the same for the Oregon products. The event is funded in part by a $200,000 federal trade grant. I believe it is the largest organized effort (so far) by Northwest winemakers to break into the European markets. It will be interesting to see if this seedling can grow to bear fruit. 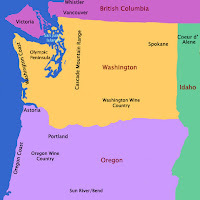 Washington and Oregon are important winemaking regions, of course, but their reputations and sales are concentrated in the United States. Although Oregon Pinot Noirs are always included in the discussion when people anywhere talk or write about new world Pinots, the fact is that not much of it is sold abroad. Oregon wine sales in the UK and France were just over 2000 cases in 2006, for example, out of total production of 1.6 million cases. The word may be out around the world about Oregon wines, but wine distribution and sales haven’t followed — yet. I don’t have figures for Washington wines, but I suspect that the situation is more or less the same. Washington makes excellent wines (better than Oregon wines, if you judge by the Wine Spectator and Wine Advocate ratings, where several Washington wines receive 95+ points), but so far Washington doesn’t seem to have that one distinctive wine that could establish an international reputation. The state is too varied, I think, in terms of climate and geography for that to happen. Washington is Riesling country, judging by volume of production, but it hasn’t yet established an international reputation with this wine (although it is trying to do so with the Riesling Rendezvous conference). A variety of reds do well here, including both the Bordeaux and Rhone varietals, but no signature style of wine has emerged as the champion. Marty Clubb is telling the people in London that Washington has the ideal climate for wine (that’s the official Washington wine theme), which may be true but doesn’t really define the product for confused international buyers. Washington does have one advantage over Oregon in the export market: distribution muscle. The Washington wine industry features a few very large players that have the financial clout to potentially open up foreign distribution channels. Money is necessary; it isn’t easy to establish a brand abroad in this crowded market and margins on exports are necessarily lower than for domestic sales, at least at the beginning. I have read that export sales by small scale winemakers are “vanity” projects and there may be some truth to this. That doesn’t mean it’s not worth doing, however. The Chateau Ste Michelle family of wines have penetrated some European markets. I was surprised to discover a large display of CSM wines in an upscale supermarket next to the train station in Riga, Latvia, for example. I haven’t been able to find out how the wines got there yet — my guess is that CSM’s deal to distribute Antinori wines in the U.S. may be reciprocated by Antinori in Europe but I don’t really know. Other Washington wines including Columbia, Covey Run and Hogue are part of the Constellation Brands portfolio, which may aid in their international distribution, too. The London tasting isn’t the first effort to get Northwest wines attention in the UK. I remember being in London in about 1990 and walking into Fortnum and Mason only to be shanghaied by an excited clerk who was directing anyone she could to a lonely wine tasting display where they were sampling wines from Hogue Cellars of Yakima. Needless to say, no one had any idea where Yakima was located, but they were amazed that such a unlikely place could produce good wine. Today’s London event is a much larger project than that Fortnum display, but the goal is much the same, to make friends, establish relationships, and get our foot in the door. I hope the London tasting goes well. Many of the wineries are apparently looking for UK distribution, which makes sense. The UK is the most important wine market in the world. It is a good market to sell wine and to establish a worldwide reputation. A disproportionate number of the world’s leading wine writers and experts are based in London, including Jancis Robinson, Oz Clark, Michael Broadbent and Steven Spurrier. A good word by any of these celebrity wine critics would encourage wine enthusiasts in the UK and around the world to give Northwest wines a try. But the real prize would be a distribution deal with Tesco or Sainsbury’s, which dominate supermarket sales, or one of the big high street wine store chains, since you can’t try wines you can’t buy. One reason this is a good time to try to break into the UK and European markets is that the exchange rates favor U.S. exports. The dollar fell dramatically in 2007 against both the Pound and the Euro, making U.S. wines relatively less expensive. This will help, but it will still be difficult to get British wine drinkers to think beyond Gallo and one end of the market and Napa Valley at the other. It’s tough to break into foreign wine markets. Ernie Hunter famously did it the DIY way — he brought his wines to London and entered them in the Sunday Times wine festival, where they won the people’s choice award. Ernie was from New Zealand and his surprise victory paved the road for Marlborough Sauvignon Blanc’s dramatic rise in the world of wine. Washington and Oregon are taking a direct and organized approach, with tastings and seminars. Every case is different. My next post will tell an unlikely story of how Washington wines first came to Sweden. Isn’t the effort to sell Washington wines into European markets complicated by a “wine glut” of overproduction by European winemakers? I recall reading last year that European vineyard owners were being offered incentives to take vineyards out of production. I can see a problem for NW wine producers in that the market may be already saturated with New World style wines. With California and Australia wines already being distributed in the UK and a lack of focus of what the “essence of Washington” is, consumers will in fact be confused. My experience with younger wine drinkers in Belfast and Dublin are that their palettes tend towards the old world styles of the Rhone and Bordeaux. Perhaps education efforts may need to take place to encourage European drinkers to appreciate the special nuances Washington Wines (especially Red Mountain Merlot, Horse Heaven’s Cab Sav. and Walla Walla Syrah’s) have to offer. A reciprocal of what French producers need to do to increase their market share in the US.